1. Dr. Zakir Naik yang memberi pendapat tidak boleh dan dilarang secara total. 3. 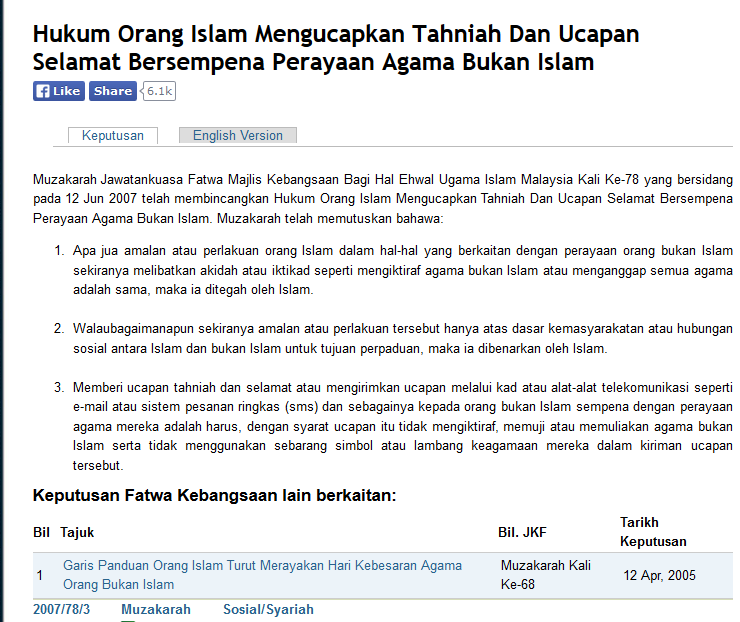 Keputusan Majlis Fatwa Kebangsaan yang menyatakan harus atas dasar perpaduan negara. 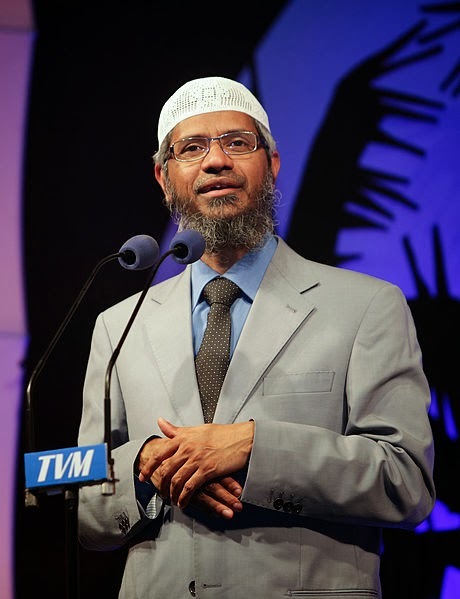 Saya lebih cenderung dan bersetuju dengan pendapat Dr. Yusuf al-Qaradawi dan keputusan Majlis Fatwa Kebangsaan mengenai hal ini. 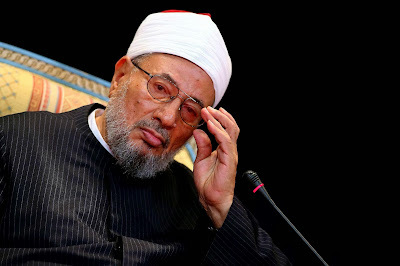 Dr. Yusuf Al-Qaradawi (president of the International Union of Muslim Scholars) considered it permissible to congratulate Christians and other People of the Book during their Holidays. He has also proposed to replace the term “Ahl Aldhimma” (dhimmis) with “Citizens”. This occurred in responses to questions during the past few days regarding the permissibility of greeting and congratulating Christians during Christmas (i.e. wishing them a Merry Christmas). “I consider it permissible especially if they are your relatives, neighbors, colleagues and classmates (a significant relationship exists)”. “It is permissible as long as they are not hostile towards us”. Dr. Al-Qaradawi mentioned that considering the current global context was what led him to differ with the great Scholar of Islam Ibn Taymiyya, who considered it impermissible to greet and congratulate Christians and others during their holidays. “[I consider greeting and congratulating them during their holidays] an aspect of “kindness” (birr) that Allah did not deem impressible, but in fact loves as he loves us treating them justly; ‘Allah forbids you not, with regard to those who fight you not for (your) Faith nor drive you out of your homes, from dealing kindly and justly with them: for Allah loves those who are just.’ [60:8]”. Dr. Al-Qaradawi followed that this should be the case especially if they greet us during our holidays, citing the verse “When a (courteous) greeting is offered you, meet it with a greeting still more courteous, or (at least) of equal courtesy. Allah takes careful account of all things.” [ 4:86]. Dr. Al-Qaradawi elaborated saying “We need to consider the Original Intents (maqasid) of the All-Wise Legislator (Allah), study the details in light of the bigger picture of Shariah, and take the different texts into consideration. Didn’t the Quran say “Allah forbids you not, with regard to those who fight you not for (your) Faith nor drive you out of your homes, from dealing kindly and justly with them: for Allah loves those who are just.” [60:8]. This is the foundational statement regarding this issue. “What matters is the subject and the content, not the jargon and terms. We need to revisit many issues related to non-Muslims and Women. We need to put emphasis on the “Fiqh of Facilitation” and the “Fiqh of Gradualism” so that we could accommodate our changing context. Ibn al-Qayyim said: “As for greeting and congratulating them on their rituals of kufr, it has unanimously been deemed impermissible. Under this goes greeting them during their holidays or fasts by saying “Happy Holiday” etc. Whoever does this is committing an impermissible action, that’s if he didn’t actually fall into kufr. Its as if you are congratulating them for prostrating to a cross. It’s actually a greater sin than congratulating them on drinking alcohol or murdering or committing adultery. Unfortunately, many people fall into this mistake, not knowing the severity of their action. For whoever congratulates a person for a sin or an innovation or an act of kufr is susceptible to Allah’s Anger. In fact, some of our scholars used to avoid congratulating tyrants or incompetent judges for their positions, in order to avoid Allah’s punishment. * perkara yang sering timbul bila krismas, dulu2 ok jer. 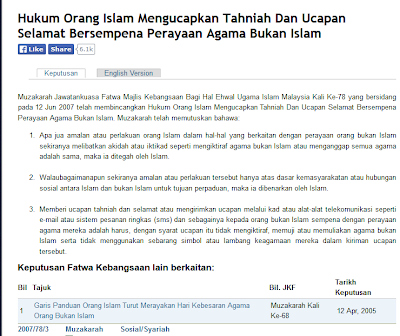 org mcm kita ni ikut je fatwa dan bkn ikut pendapat perseorangan.